Ideally situated on the top two floors of this small, exclusive WeHo building, this architectural gem is not to be missed. 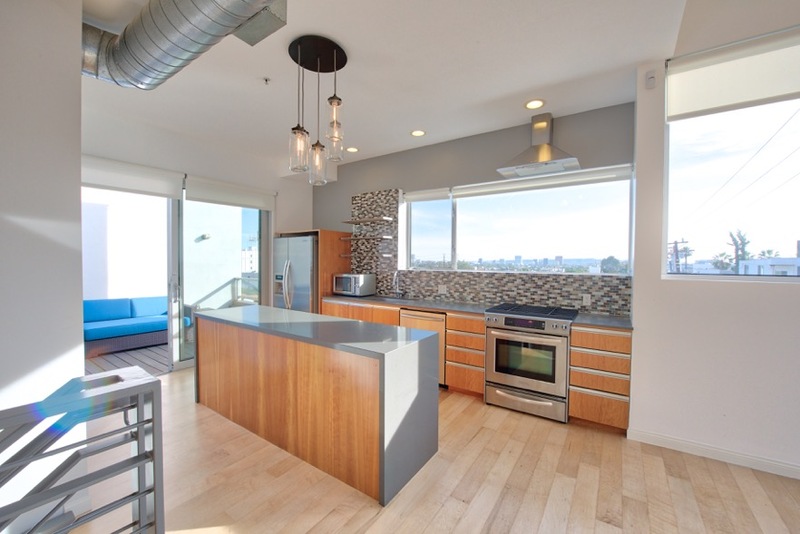 Take in the near-360 degree views of LA and enjoy the open, airy floor plan. The modern kitchen with elegant stone countertops and Bosch appliances is perfect for a cooking enthusiast. Dining and living rooms both feature Jonathan Adler chandeliers, customers blinds, and a powder room for guests. Sunny days call for relaxation on your private outdoor deck with unobstructed views of the city. Head downstairs to your master suite, complete with floor to ceiling windows and custom blinds. Master bath features natural stone and marble, a deep soaking tub and spa-like shower. Bonus den perfect for a home office or guest area. Private laundry/utility room. Two-car tandem, gated parking. With a walk score of 88 and close proximity to the Sunset Marquis, Equinox, Soul Cycle, and all the nightlife on the Strip and Santa Monica Blvd., you’ll love your new home!